We are glad to announce that SOAP format joins the supported formats of Feng-GUI web services. and Mashable web design toolbox. After decades of TV, Radio, Magazines and now Internet, we find ourselves in a society overwhelmed by information begging for attention. As a result of that we have a world with an attention span now shorter than a goldfish’s. How is the media and specially the web facing that? And how can we take advantage on way the human mind works? optimize your AdSense location and style using Feng-GUI heatmap. We recently posted a preliminary and small version of documentation for Feng-GUI Services API. We are very eager to receive feedback from members of the Beta community as they access this documentation over the next several weeks so we can use that feedback to improve our first API version to be released in October. The API is implemented as XML over HTTP (XML-RPC). Send an XML Request and receives an XML response. The Server Endpoint also contains automatic documentation of the API. Right now, the service API methods are partially-functional and your images appears at Feng-GUI.com MRU list. Over the last months we are working on a new platform that will enable you to use Feng-GUI attention and attraction technologies through web services. Members of the Private Beta group will have access to the specifications draft of the API and benefit the option to ask for changes and modifications before we finish the implementation. Feng-GUI open web Application Programming Interface (API for short) means that anyone (well, right now, only members of the Beta program) can write their own program to integrate Feng-GUI technologies and services in new and different ways. For example, you could automate usability testing, Optimize your Ad placement , create a Photoshop plugin, etc'. on How Little Do Users Read? On the average Web page, users have time to read at most 28% of the words during an average visit; 20% is more likely. Scientists have developed a computer model that predicts the brain patterns elicited by looking at different images -- a possible first step on the path to mind reading. 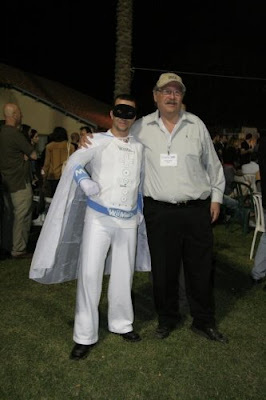 The GarageGeeks and Yossi Vardi invite you to a special garage party event: "GarageGeeks hosting Google"
The event will take place on Thursday May 15th, 21:30, Garage HQ (Hapeled 40, Holon). Feng-GUI for Videos will be demonstrate at DisrupTV convention (23 May). We will show how to predict people's attention in videos, commercials, and games. Disrupt.TV is an un-conference intents to bring together Israeli and global Technology, content and creative talents that are taking part in creating the future of TV and media for sharing knowledge, exploring the opportunities and to spark new ideas about how TV and Video will change us and we will change TV. It is aimed for people who are in the conjunction of Media, Content, Creative and Technology. An Eye Tracking study designed and analyzed by Next Century Media was carried out by PreTesting and TACODA. That study shows that Behavioral Targeting averages 17% more Ad Looks than Contextual Targeting, and this average increases to 54% more Ad Looks after the first exposure. In other words, as frequency builds, the same ad increasingly gets filtered out in the Contextual environment, but apparently as a result of surprise, the level of Ad Looking stays up in Behavioral. The first Eye Tracking study ever conducted comparing Behavioral Targeting to Contextual Targeting finds that, on average, the same ads receive +17% more Looks when seen in unrelated-content sites, than when seen in sites specializing in the sale of those types of products. After the first exposure, this +17% advantage for Behavioral over Contextual Targeting increases dramatically to +54%. The fact that Behavioral Targeting, unlike Contextual Targeting, tends to build with frequency, suggests that there is a Surprise effect and that it does not wear out, and because of this repeat Surprise effect, the ad is given more chances to engage the user. Who are the "Natural Born Clickers" and what is "the Invisible Hand" ? KinnerNet Un-Convention is always a blast. and this year it was an explosion of geeks, technologies, art, food, humor … you name it. I will not be able to describe (like last KinnerNet 2007 review I did with the blog WMMNA) in one small post, everything that happened this year. So, please accept my apologies, while I am only sharing my own contribution to this art-tech frenzy. 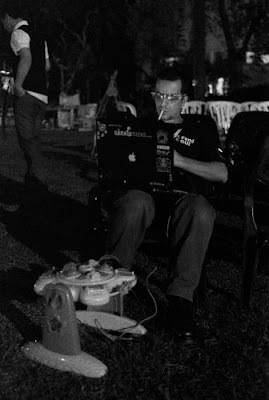 As an artificial vision explorer at Feng-GUI and a GarageGeeks member, I was invited to KinnerNet2008, and here is my contribution. WiiMan the Super Hero is a full action figure costume of a super hero that functions as a Nintendo Wii remote. Having trouble playing Wii? WiiMan to the rescue. This project combines Gaming, Technology and Useless Activity to the extreme. The GarageGeeks along with Yael Hertzog built this custom that acts as a fully functional Nintendo WiiMote remote with buttons, Bluetooth, accelerometers, and an IR cam. 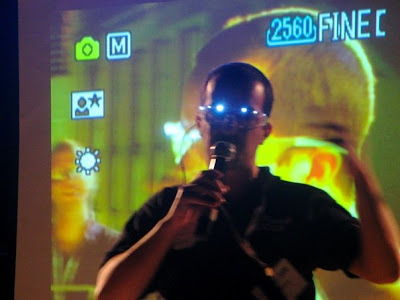 * iLed - Wearable party led lights glasses which flickers between 8-16 Hz and amplitude is based on a microphone input. Hallucinogen state of mind, not included. 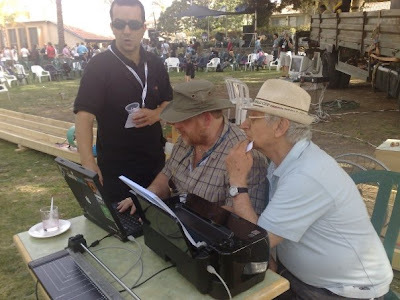 Hagai Cohen requested my programming skills creating a souvenir for KinnerNet 2008 participants. A business card with a stretched font that is readable only when you tilt the card. 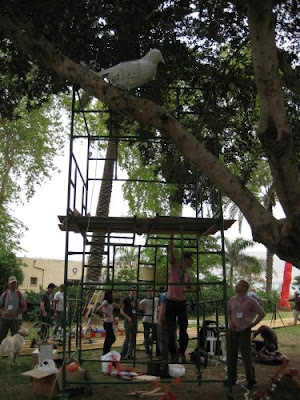 The garagegeeks built a huge Dove that sense if someone is underneath it and crap a small spit of Dove soap on him. I helped with the sound effects. A workshop conducted by Michael Shiloh (MakingThings, MAKE magazine and OpenMoko) and Hanoch Piven (www.pivenworld.com) I built this Fakir’s hours made out of computer parts. 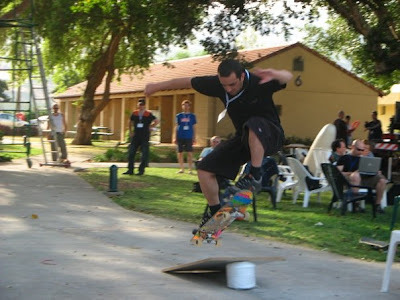 Oren Zuckerman from IDC Herzelia and MIT's Media Lab organized a spontaneous Skateboard session. Feng-GUI will be presented at CIL2008 the 23rd annual Computers in Libraries — the most comprehensive North American conference and exhibition on all aspects of library & information delivery technology. Although the tools and technology available to libraries & information services have changed over the years, the excellent quality and range of both topics and speakers at Computers in Libraries 2008 remain the same. Thanks to Frank Cervone, Darlene Fichter, Anna Creech for the information, and to Steve Campion for the photo. Thank you Arnold Van Bezooyen for sharing Feng-GUI with your readers. ReadWriteWeb published a list of "Best Tools for Visualization"
Here are some latest Feb.2008 reviews about Feng-GUI from all over the web. Mihkel Jäätma, an Objective Digital partner from Realeyes.it, has created this compelling example that shows you need 35-50 people to draw valid conclusions from eye tracking. However, he holds that useful information can be gained from fewer participants. Thanks to James Breeze for the information. "But Feng-GUI doesn’t use real eye tracking, which would require that humans look at each object being measured and would hardly scale very well. Instead, the site uses an algorithm that attempts to guess what a real human would be most likely to look at." 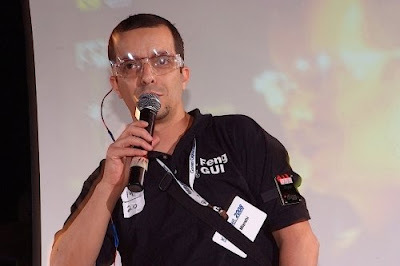 Our made man, Ohad Eder Pressman reached to Speaker level at DLD* 2008, lecturing about connecting the Physical and Digital worlds. DLD conference is a blast of sharing ideas, thoughts and vision. Michael Reinboth from Compost records, Munich, kindly had a meeting with us and we discussed about various ways to integrate the GarageGeeks activities with the music industry in Germany. At this music workshop, we are creating modified toys music controllers that send their MIDI or Audio information to central audio and visual stations. Schedule19:00 Garage Open: Prepare your "Basta". 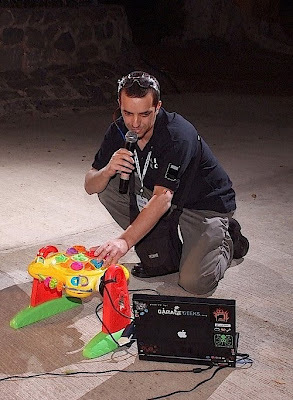 20:00 Workshop agenda: Enough with Baby Einstein, its Baby Clubber time. * Experienced music technicians and interactive designer. * The event is open for everyone. You can join others (see /write in the wiki http://wiki.garagegeeks.org) by helping take apart and stuff the musical toys with gadgets. The Garage will be wired with MIDI, and Audio cables. Each station can choose from several methods of communication to the central stations Hub. Your Toy output can be connected to the central stations or to your Laptop, and from there, to the central stations. Cables:MIDI, LAN, Audio and converter accessories. USB Keyboard to take apart. Here is a list of ingredients to build a Music Toy Controller for anyone who wish to participate but is not so skilled or equipped. A Toy wired with Keys from a USB keyboard sending keystrokes to a utility (MouseTrap) which translates them into MIDI messages, mapped by MIDI-OX into Ableton Live. * USB Keyboard to take apart (also a mouse can be used). * wires, solder, glue gun. * anything else you wish to do with your lovely musical Toy. Toy+USB Keyboard->laptop->MIDI device or Audio->central station. Toy->laptop->MAX/MSP with MIDI module->MIDI device->central station. Toy+ Arduino with MIDI module->laptop or central station. 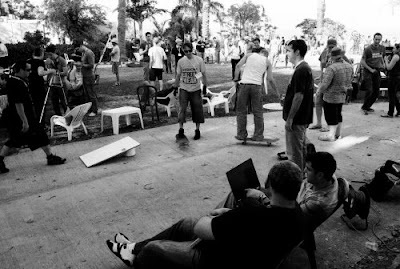 notes: Don’t buy a board without understanding what you are buying and how to operate it. The board kits are pretty easy to build, but prepare them at home because it takes several hours to assemble a 50$ kit. Get a Toy, disassemble it at home and look for ways to attach the sensors or potentiometers onto it. Prepare your board and test it with the sensors or potentiometers. A handful of parts (knobs, slides, etc') that you can hook on the toy, bring extra, maybe others can use them. 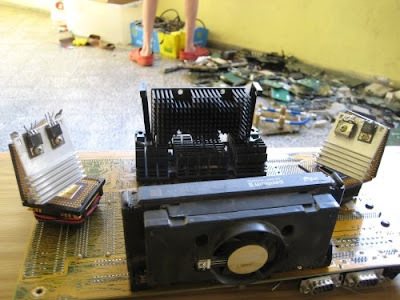 tour some electronic shops for such parts, or just take them from electronic junk you still didn't throw away. Use to monitor midi messages, send midi from your keyboard, map midi devices and more. OSC is meant to supersede the MIDI While MIDI requires a MIDI USB device, OSC communicate via a standard home or studio network (TCP/IP, Ethernet) or via the internet. MouseTrap - MouseTrap lets mouse and keyboard act as general purpose Midi / OSC control hardware. Matei Mancas, PhD focus his research at the Faculty of Engineering, Mons, Belgium (FPMs) on Computational Attention. His research demonstrates several interesting applications that employ computational attention. Matei also developed with two of his students Simon Wallerand and Fre'de'ric Lavis, a mouse-tracking technique he used as a a validation tool for his thesis. You can participate online in his research by adding your own mouse (that follows your eyes) movements to the research results. You can upload your images and get the mouse-tracking results on these images. You may also upload entire sets of specific images and than ask for the top-down model to the website administrator. 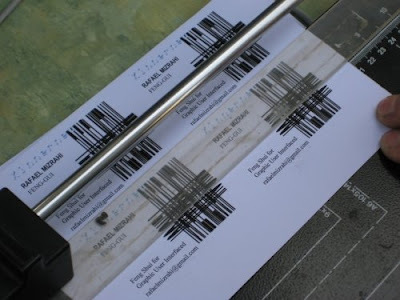 It is natural in a visual search to look at any object that is similar to the target so that it can be recognized and a decision made to end the search. Eye tracking technology offers an intimate and immediate way of interpreting users' behaviors to guide a computer search through large image databases. This work describes experiments carried out to explore the relationship between gaze behavior and a visual attention model that identifies regions of interest in image data. Results show that there is a difference in behavior on images that do and do not contain a clear region of interest.